Set in the early 19th Century England, Trapping A Duchess tells the story of formerly affianced couple, whose marriage-to-be ended when Sophie left Andrew humiliated at the altar. The two would be more than pleased to never have to see one another again until they come face to face while rivaling for the affections of two members of the same family. Tempers - and desires - flare as the pair does their best to outwit one another. But fate has other plans, including a seduction that changes everything. We will send Trapping A Duchess to your Kindle at . 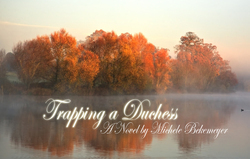 Trapping A Duchess has been sent successfully to your Kindle!